Helping a friend or family member to learn to drive is an important commitment. Gone are the days of simply sitting in the car while your son or daughter drove around. Now the role of the sponsor is one with considerable responsibility that is vital to the success of the learner driver in the learning-to-drive process. Driving is a lifelong task that has responsibilities and your support during the learning-to-drive process would help to shape their behavior and attitude to road safety. Parents...are you ready to be the sponsor? In order to be a suitable and effective sponsor, you must have held a full driver license for at least two years, and preferably, five years. It is recommended that a sponsor has at least 100,000 kilometers of driving experience. Your role in the learning-to-drive process is as important as that of your learner driver and their approved driving instructor, known as an ADI. Therefore, it's important that you all work together to help the learner to become a safe and socially responsible driver. When you are chosen as a sponsor, it's important that you develop a learning structure with your learner driver that is both achievable and effective. This could include agreeing in advance when you will have practice sessions in-between formal lessons, setting a structure for reviewing the learner's progress by using their log book and planning and preparing a schedule of practice sessions. An important tool in helping you to plan practice sessions with the learner driver is the EDT learner logbook. The learner driver's ADI will provide feedback in the learner's logbook, which is aimed to helping you and your learner to structure practice outside of formal lessons. As sponsor, your role is to compliment the work of the ADI by supporting the learner driver as they practice what they have learned in their lessons in a wide range of driving conditions and environments. Your role is to enable the learner to gain valuable experience and confidence as they learn to drive. Do try to provide your learner with practice opportunities related to their training plan. Don't simply look for a lift somewhere, but think about practice routes. For example, how can you best plan a route that will incorporate the objectives set for the sessions by the ADI? Re-familiarizing yourself with the rules of the road will not only help your learner, but may also help you to become a more socially responsible driver yourself. Sponsors need to work closely with the ADI in order to ensure that the learner's best interests are being met in a safe and realistic way that best suits the learner's own learning style. It's important to build a relationship with the learner driver's ADI so that you work together to identify what practice is required and to clarify what is to be done and when. Before you begin your sponsor role, it is recommended that you meet with the ADI and to discuss with them the best way to support the learner driver as they learn to drive. For example, knowing at what point during the learner's training you should get involved, planning practice sessions between lessons and where you can find support to help you in your role as sponsor. Some sponsors find it helpful to accompany their learner on one of their lessons with the ADI, so that they can better understand the format of the driving lessons and how they can best learn to support. Being asked to be a sponsor shows that the learner driver trusts both your ability to drive and your ability to guide them to be a safe and socially responsible road user. So give the role and the learner driver the time and effort that they deserve. The most important thing to remember is that this is the first step on their lifelong journey of safe, responsible and enjoyable driving. 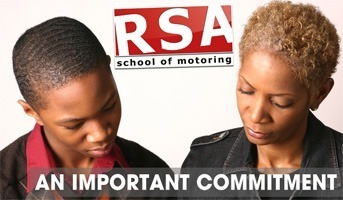 For more information on learning to drive, visit RSA.ie.